Note: USRC. One 40 pound parrot rifle, two 84 pound brass Dahlgren howitzers, muskets, rifles, cutlasses, handguns. 48" x 9' engine, Fletcher & Harrison & Co., North River Iron Works #48. 9' shell, 33' long boiler. Blowing engine 12 x 12" Pony boiler 6' x 36" diameter driving Sewell pump & boiler for heat. 25' diameter, 8' face wheels. 12" x 12" blowing engine. 6' x 36" dia. pony boiler, driving sewell pump and blower for heat. 25' dia., 8' face wheels. 1902, Dec 29 Documents surrendered. Stationed Detroit, jurisdiction Lake Huron, Lake St. Clair & rivers; duties being to examine clearances of vessels, prevention of smuggling & assist vessels in distress. 1869 Only revenue cutter in service; rest laid up until recommissioning Aug 2, 1870. 1870, Nov Helped tow propeller CITY OF DETROIT off westward side Bois Blank Island, Lake Huron. 1871, Oct Sent with provisions to aid in relief of fire victims, Michigan thumb. 1879, Nov Layed up for season after biggest season ever performed on fresh water. 1882, Apr 15 Received new iron hull, dry dock, Buffalo, NY. 1883, Mar 27 Sold to Union Dry Dock Co., Buffalo; dismantled, converted to barge; renamed DAN ROGERS, US35476; engine into WILLIAM P. FESSENDEN (1883), 182 x 28.6 x 10.6', 324.25 gross / 308.04 net tons. 1886 Towed by J.E. POTTS. 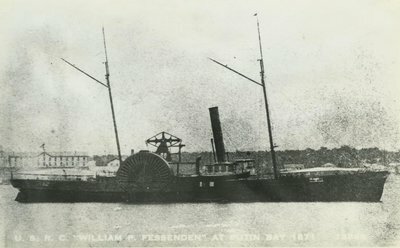 1887 Towed by ALPENA with WINONA, BANNER, MENTOR. 1889, Jul 25 Owned W. H. Gilbert, Saginaw, MI & W.H. Keenan, Niagara Falls, 308.04 gross tons, 180.2 x 28.6 x 10.6. 1893, May 3 Slight damage from fire at Buffalo. 1898 Towed by T.D. STIMSON. 1899 Towed by W.H. GILBERT. Email your Order Comment on this item Create electronic postcard Put-In-Bay. Detroit River. detail Chippewa, Detroit River. 1867 Detroit, MI.